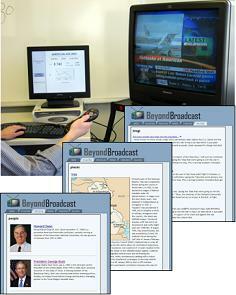 A while back, I had the privilege of seeing a demo of Beyond Broadcast, which is a project of Northwestern University's Infolab. Infolab is the group that brought us Watson search technology. With Beyond Broadcast, Infolab is attempting to bring the same level of context awareness to your television that Watson brings to your desktop. For those of you unfamiliar with Watson, it is a search engine that essentially watches over your shoulder while you work. While you are typing a Word document, or typing in PowerPoint, or browsing the Web, Watson is analyzing the contents of the current window and compiling a list of search results from user-specified sources. The effect is that you have relevant search results before you ask for them. Beyond Broadcast has, roughly, the same aim. While you watch, it's combing guide data and the close caption stream to understand what it is you are watching. Infolab basically hijacked a button on the Tivo remote, and when it is pressed it fires off a query to the Beyond Broadcast search engine. The results are displayed in a monitor next to the television. For instance, if you are watching the Oscars and Alan Arkin is on the screen at the time, you can press the button on the remote and a query is submitted to the search engine. Since it has been watching the guide and close caption stream, it knows that you are looking at Mr. Arkin seated at the Oscars, and that he is a nominee for Best Supporting Actor for the film Little Miss Sunshine. What this does is allow the search results to be much more targeted. Not only can you get biographical information about Alan Arkin (especially with respect to the movie), but you get the opportunity to purchase the movie from Amazon.com, you get geographical data showing the location of the Oscars... You get the idea. The reason I bring this up (besides the fact that it's cool technology) is that more and more context will be leveraged to increase the value of interactions with technology. Already, you can tailor an experience to the device mediating the experience (for instance, viewing this site with a WAP device returns only contact information). In the future, GPS data will allow you to understand not only what the user is asking, but when and where they are when they ask it. Aggregating that information with current news, geo-tagged, weather, reference (and other available data), will allow a system to infer specifics regarding the user's current situation. Doing so allows the system to provide content tailored to the user's specific situation.